Healthcare and well-being of Belarussian nation is the issue both the government and the citizens care a lot. Healthcare in Belarus is free of charge in all governmental clinics and hospitals although there are some procedures such as ultrasound, full medical check-up for a driving license that should be partly or fully covered by the patient. As for the medicine prescribed by the doctor it can be bought in numerous pharmacies. Pharmaceutical industry in Belarus is a new, rapidly growing and actively developing one. There are two major national pharmaceutical factories that are producing medicine to cover the needs of hospitals, clinics and citizens. Numerous joint ventures in this sphere appear every year. Belarus cooperates with the Netherlands, India, Germany and France and carries out experiments in developing new methods of alleviating pain and suffering of those in need. Pharmacies in Minsk are located in every big shopping centre, public place and district. 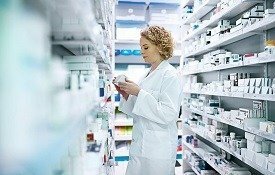 More than 30 pharmacies in Minsk are open 24/7. A number of chemist’s nets operate on the territory of Belarus. Some pharmacies in Minsk make mixtures on a doctor’s prescription. To buy a particular type of medicine it’s essential to have a prescription though there exists a long list of pills and mixtures that are sold to everyone who asks for them. The prices in many pharmacies in Minsk are conservative and usually there are some discounts for the elderly and loyalty card holders. People with grave diseases obtain medicaments for free, which is also a part of the national healthcare policy. A pharmacist can give you a piece of advice on what medicine to buy if you’ve unexpectedly came up with a cold, a sore throat or a headache. Besides medicine, vitamins, body and skin care bio shampoos, scrubs and cleansing gels are distributed through pharmacies. You can find out where the nearest pharmacies in Minsk is situated or whether a medicine needed is available in it by consulting special websites such as 103.by and tabletka.by. Make use of the list of the pharmacies in Minsk provided on this page and be healthy and happy!